Groucho Marx was an American comedian and film and television star. He is known as a master of quick wit and widely considered one of the best comedians of the modern era. His rapid-fire, often impromptu delivery of innuendo-laden patter earned him many admirers and imitators. He made 13 feature films with his siblings the Marx Brothers, of whom he was the third-born. 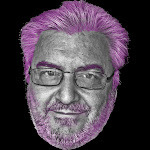 He also had a successful solo career, most notably as the host of the radio and television game show You Bet Your Life. His distinctive appearance, carried over from his days in vaudeville, included quirks such as an exaggerated stooped posture, glasses, cigar, and a thick greasepaint mustache and eyebrows. These exaggerated features resulted in the creation of one of the world's most ubiquitous and recognizable novelty disguises, known as "Groucho glasses", a one-piece mask consisting of horn-rimmed glasses, large plastic nose, bushy eyebrows and mustache. 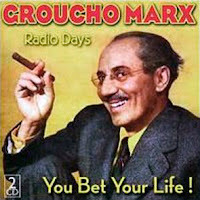 0 comments on "Groucho Marx - You Bet Your Life 1949 - 1957"